Earthquake insurance is a form of property insurance that pays the policyholder in the event of an earthquake that causes damage to the property. 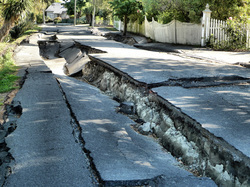 Most ordinary homeowners insurance policies do not cover earthquake loss. How Much Does Earthquake Insurance Cost? Most earthquake insurance policies feature a high deductible, which makes this type of insurance useful if the entire home is destroyed, but not useful if the home is merely damaged. Rates depend on location and the probability of an earthquake. Rates may be cheaper for homes made of wood, which withstand earthquakes better than homes made of brick. Contact Us to learn more about your options when it comes to earthquake insurance.